We had out-of-town visitors with us over the weekend. One of them is a designer/builder, and he brought his two snow-deprived teenagers with him. They did some skiing, and then they used all the snow in our garden to build a 4-person igloo worthy of providing actual shelter. The garden is not the pristine sheet of white it was last week, but we have an igloo. If you let energetic snow-deprived designer/builder families loose in your snow-filled garden, an igloo is practically inevitable. As the WWF speaker saw it, there are two levels of how to deal with a bear. One is based on how a bear actually behaves, the other is what kind of bear behavior people are willing to tolerate. Local officials are setting the bar at people’s fearful level of tolerance, not at how bears really behave. If this keeps up, the bear is doomed. There were several suggestions on how to deal with regular, non-aggressive bear behavior – which according to WWF, is what M13 demonstrates. Learn to make loud noises to warn bears away, keep all trash safely stowed, etc. The measures taken in many places around the world where bears are commonplace. Now, I’m not sure what kind of realistic future a bear population of 1 has, but this seems to be a good example of how local politics and media can lead or doom larger policy. The thing about this kind of destruction, whether it’s of a bear or any other species under protection, is that it’s final. For those who saw the bear as a ‘problem’ animal, the problem is now solved. *Contrary to what the article states, M13 was not one of a few bears in the country, he was the only bear. Bears do occasionally wander up from Italy. 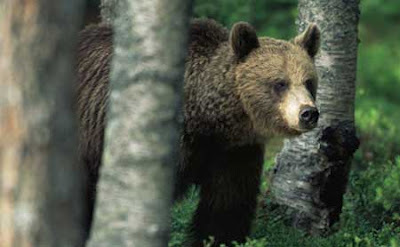 Currently, however, there are no other known bears on Swiss territory.